Do-It Corporation provided Stur with a custom designed totem display that allows twelve Stur bottles to be displayed at a time. In addition, the digitally printed attached sign provides a custom billboard to showcase detailed product features of the liquid water enhancer. 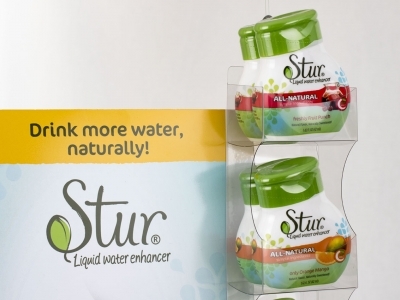 This allowed Stur to remove individual paper packaging of each bottle. The new totem display from Do-It Corporation provides a reusable, mobile display option for their products.